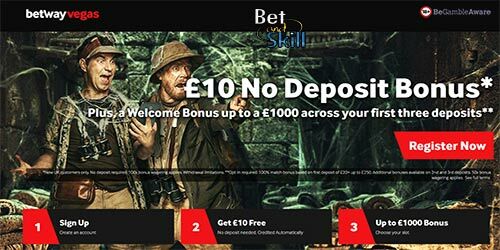 Claim £10 No Deposit Bonus when you join Betway Vegas, as seen on TV. Find here how to create an account and start playing with £10 credited automatically, with no deposit required! Plus, get up to £1000 bonus across your first three deposits! 3. As new UK customer, you will receive a £10 free bonus, without any deposit! AS SEEN ON TV! 4. Should you decide to deposit, you will unlock the £1000 super bonus across your first three deposits! Since 2006 Betway has remained at the forefront of the online gaming industry, utilising the very latest software to provide an interactive and innovative gaming experience, within a safe and secure environment. Betway Vegas is the latest product launched by the company, featuring over 500 online casino games, including some of the very best slots and a variety of table games such as craps, baccarat, video poker, blackjack and roulette. New slots are being added every day, like Game of Thrones, Jurassic Park and Max Damage and many are available on desktop as well as mobile devices (for Android and Apple users). Looking for jackpots? You can play all the most popular progressive slots at Betway, including the world-famous Mega Moolah. The largest amount ever won on an online slot – a huge £13,213,838 - was won at Betway! The Customer acknowledges that in order to be eligible for this Free Bonus offer they must be holding residence in the United Kingdom. Betway Vegas reserves the right to withhold the Free Bonus and/or lock the customer’s account and/or confiscate the customer’s balance in the event of any misrepresentation. The £10 Free Bonus is a no-deposit-required offer and is only valid to New Customers who saw the TV ad relating to the offer. To qualify for this Free Bonus offer, a New Customer must register a Real Account at Betway Vegas. Only 1 Free £10 Bonus is permitted per New Customer and will credited to the Bonus Account. Please note: the Free Bonus may take up to 5 minutes from the point of registration to reflect in the Casino Account (and in some cases this may take longer). We recommend that the customer logs out of the software and logs back into the software in the event that the bonus does not immediately reflected in the Casino Account. The £10 Free Bonus is subject to one hundred (100) times playthrough requirement before funds can be withdrawn from the casino account. Betway reserves the right to limit withdrawals from any free Bonus/free games/free spins added to a customer’s account to £100. This limit will apply should a Bonus be granted with no deposit being made unless specifically stated otherwise in the promotional offer. The £10 Free Bonus offer is only permitted once per person, household, family, household address, email address, credit card number or shared computer environment (example: a library, workplace, fraternity, university or school). Betway Vegas reserves the right to void all winnings and play should this term be disregarded. The Free Bonus offer is only valid to the person who registers the Real Account and is not transferable. Playing certain games will contribute a different percentage towards the wagering requirements. For example, if you wager £100 on Roulette, £8 will contribute to the wagering requirement. Should you play on any excluded games (0%) before meeting the playthrough requirement, you agree that Betway Vegas holds the right to void any winnings made from such games at its discretion. Please be aware, wagering made using the Gamble Feature on Slots or the Double Feature on Video Pokers will not count towards playthrough (wagering) requirements. "Betway Vegas £10 No Deposit Bonus (AS SEEN ON TV)"